This baseball game was the Tantei Opera Milky Holmes special game. The four Milky Holmes seiyuu ( Mimori Suzuko, Kitta Izumi, Tokui Sora, Sasaki Mikoi ) apeared and sang a song before the game. They also threw out the first pitch, and appeared a few times between innings. It was cloudy, and it did rain a few times during the game. Once it rained pretty hard. The other times it was light rain. The game started at 13:00 and went on until 16:30 or so. 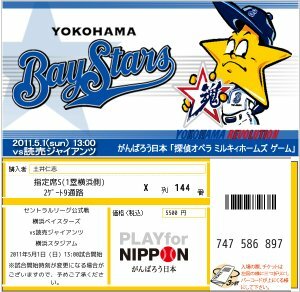 I arrived at the stadium at 12:00, and watched the last part of the Giants' batting practice. I don't think Milky Holmes made any appearance before the pregame song, which started around 12:50. I sat on the first base side, right above the Yokohama dugout. 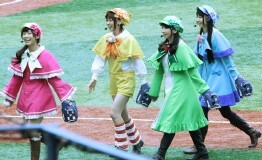 The four girls were dressed in their Milky Holmes outfits, and ran out into centerfield. They all had headsets and sang and danced in the outfield. They sang a short version of Seikai ha Hitotsu! Janai!. After the song, the four girls gave flowers to the managers and coaches of each team. Then they also threw out the first pitch. All four girls went to the mound, but only Mimori Suzuko threw the pitch from the mound The other girls were behind the mound, and just went through the motions along with Suzuko. After the game began, the Milky Holmes girls came out between innings a few times. One time, the four girls went to the box area at the top of the stadium. Suzuko and Izumi were in one box on the first base side, and Sora and Mikoi were in another box on the third base side. They cheered while the Milky Holmes song played in the background. Later, the girls came out with bazookas that shoot out presents to the stands, and fired some presents into to crowd. The first time, Suzuko and Izumi went to the first base side, and Sora and Mikoi went to the third base side. It was also raining. The second time (the rain had stopped), they switched sides. I brought my 60D and EF70-200F2.8L lens, and my compact camera (Powershot S90). I took a video of the song with the compact camera, and took photos of everything else with the 60D. The stadium is just too big to get nice closeups with a 200mm lens. Maybe I should have used my 2x teleconverter as it was pretty bright most of the time.